Scott Quigg believes he can become a two-weight World champion in 2018 – but says he’s prepared for a hard night’s work on Saturday when he faces Oleg Yefimovych in a eliminator for the WBA World Bantamweight title in Monte-Carlo, live on Sky Sports. Quigg held the WBA Bantamweight crown over six fights before losing out to Belfast rival Carl Frampton and the 29 year old has since moved to Los Angeles to team up with legendary trainer Freddie Roach, landing their first win together in April against Viorel Simion at Wembley Stadium. Quigg is honing his skills in the Wild Card Gym with the hall of fame coach and they were ringside when WBA Super king Leo Santa Cruz and regular champion Abner Mares were in action in California two weeks ago, where both men won via stoppage. Yefimovych is ranked at number four in the WBA so a win for Quigg puts him right in the mix for a World title clash in 2018 – and with the stakes high, Quigg knows it’s going to be a hard night’s work. 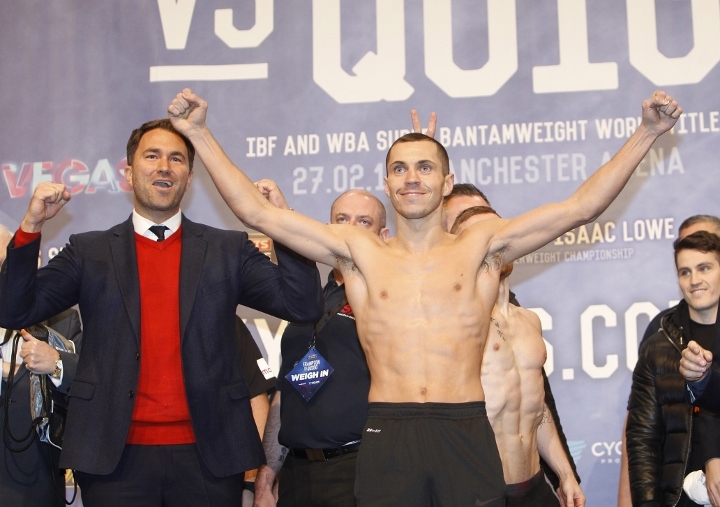 “I'm expecting a tough fight from Oleg,” said Quigg. “I know I've got a tough fight in front of me but it's one I'm very confident in with the work I'm putting in and how I'm looking in the gym. Oleg's highly ranked in the WBA so it's going to shoot me right up there. I’ve never boxed in Monte Carlo so it’s another new experience and one I am looking forward to. A rematch with Frampton is a fight that Quigg would also love, and like Quigg, ‘The Jackal’ has recently made a training switch from Shane McGuigan to Jamie Moore. “I made some big changes,” said Quigg. “I needed to make them big changes and I felt the benefits of it. “It's good to have something different, Freddie has unrivalled experience and teaming up with him was only ever going to improve me. I’ve been getting back to my boxing with Freddie, getting behind the jab and simplifying things. It’s all been about letting my skills flow and not smothering my work, and that will let my natural power work. I’ve been learning every day and most importantly, I’m happy. “I have no doubt Carl will be the same. He's been with the McGuigans for a long time and sometimes you just need a change. “I do think the change will benefit him, it will do him good. The main thing is you've got to enjoy training. If you're not enjoying it, you might as well walk away. “He's changed his trainer, he's changed his team, and it might give him that spark back that he was lacking. “I came up short but I believe I've made massive improvements already, learned from that. Those are the fights I want to be involved in. Anybody who's got a World title at 126lbs, they are the fights I want to be involved in. “I believe I can beat him, so I would love that fight, but there is Leo Santa Cruz, Abner Mares, Oscar Valdez, Lee Selby. I want to be involved in any of those big fights. On my day, I turn up 100 per cent, I believe I can beat every one of them. Quigg and Yefimovych clash on a stacked bill in Monte-Carlo topped by a pair of World title battles with Russian destroyer Dmitry Bivol making the first defence of his WBA Light-Heavyweight strap against Australian Trent Broadhurst while Jamie McDonnell and Liborio Solis return to Monte-Carlo for a rematch for McDonnell’s WBA Bantamweight crown and Agit Kabayel defends his European Heavyweight title against Londoner Dereck Chisora.